"All diseases, regardless of their names, come within this understanding as only varied expressions of the one disease of toxemia." Stanley Burroughs, author of "The Master Cleanser" booklet and famous for creating the "Lemonade Diet" used by thousands every year. "Disease, old age, and death are the result of accumulated poisons and congestions throughout the entire body. These toxins become crystallized and hardened, settling around the joins, in the muscles, and throughout the billions of cells all over the body. It is presumed by orthodox medicine that we have a perfectly healthy body until something, such as germs or viruses, comes along to destroy it, whereas actually the building material for the organs and cells is defective and thus they are inferior or diseased. "Lumps and growths are formed all over the body as storage spots for unusable and accumulated waste products, especially in the lymphatic glands. These accumulations depress and deteriorate in varying degrees, causing degeneration and decay. The liver, spleen, colon, stomach, heart, and our other organs, glands, and cells come in for their share of accumulations, thus impairing their natural action. "These growths and lumps appear to us as forms of fungi. Their spread and growth are dependent on the unusable waste material throughout the body. As the deterioration continues, our growths increase in size to take care of the situation. Fungi absorb the poisons and try to take the inferior material of the organs. This is a part of Nature's plan to rid the body of our diseases. When we stop feeding this fungus and cleanse our system, we stop their development and spread; then they dissolve or break up break up and pass from the body. They will not feed on healthy tissue There is a simple set of laws which explains this action. Nature never produces anything it does not need and it never keeps anything it does not use. All unused material or waste is broken down by bacteria action into a form that can be used over again or eliminated from the body. All weak and deficient cells, caused by improper nutrition will also be broken down and eliminated from the body. "We spend a good portion of our lives accumulating these diseases and we spend the rest of our lives attempting to get rid of them - or die in the effort! "The incorrect understanding of the above truths has led uncivilized and civilized nations alike to search for some magic "cure" for all kinds of charms, witchcraft, and unlimited kinds of obnoxious poisons and drugs. In general, they are worse than useless because they cannot possibly eliminate the cause of any disease. They can only add more misery and suffering and shorten one's life still further. It has been reported in many books, and magazine articles, that many new diseases and disorders have been created by orthodox and hospital methods. As we continue to search for more and more magic "cures" we become more and more involved with complicated varieties of disease. A simple understanding and action has always proved to be the best to eliminate our negative actions and reactions. "Germs and viruses do not and cannot cause any of our diseases, so we have no need for finding various kinds of poisons to destroy them. In fact, man will never find a poison or group of poisons strong enough to destroy all the billions upon billions of these germs without destroying himself at the same time. These germs are our friends, there are no bad ones, and if given a chance will break up and consume these large amounts of waste matter and assist us in eliminating them from the body. These germs and viruses exist in excess only when we provide a breeding ground in which they can multiply. Germs and viruses are in the body to help break down waste material and can do no harm to healthy tissues." "We know that throughout nature everything moves in cycles, constantly changing, constantly cleaning out the old and building the new. Consequently, as a person reaches the "point of no return," a point where his accumulations have reached the limit of what the body can tolerate, then a rapid change takes place or he dies. The cycle has come to the point where a good house cleaning must be started, and one of nature's most effective methods is to start loosening and eliminating these poisons with bacteria action. As this action progresses, we come sick and feverish; large amounts of mucus are eliminated; diarrhea increases the discharge of waste material, and all of our resources go into action to clean us out as fast as possible to prevent these poisons from killing us. When this happens do not panic and resort to the unnatural action of drugs and antibiotics which can only defeat natures laws. The drugs stop the natural changes by suppressing the cleansing action and stores the poisons in the body to cause future problems." "When one considers that flesh foods of all kinds are extremely toxic, it becomes apparent that they are an extremely undesirable form of nourishment. In the eating of meat, one must take into account all of our eliminative organs. They are made primarily to take care of our own wastes. When we add animal flesh, containing the wastes of its cells (or drugs and other unusable materials), extra work is required of these organs and various forms of trouble will eventually develop. "Sometimes the meat can remain in the stomach for two or more hours and begin to ferment and spoil. To be broken down and digested it must pass on into the small intestine. All forms of meat take longer to digest than do fruits and vegetables. Chicken and other fowl take the longest of all. Just because meat is already a form of flesh it does not follow that it is readily usable by our bodies. In fact, just the reverse is true. "Remember that all solid food must be broken down into a liquid form to be carried by the blood before it can nourish the body. Flesh foods of all kinds (including fish)take much longer to reach this state and are less useful to the body than fruits, vegetables, and seeds." "All mucus diseases such as colds, flu, asthma, hay fever, sinus and bronchial troubles are rapidly dissolved and eliminated from the body, leaving the user free from the varied allergies which cause difficulty breathing and clogging of the sinus cavities. Allergies exist as a result of an accumulation of these toxins and they vanish as we cleanse our body. People who are overweight often experience these difficulties, and the more they continue to eat the toxic fat-producing food which causes their obesity, the more other ailments multiply. "Mucus disorders are brought about by the eating or drinking of mucus-forming foods. In other words, if you have these diseases, you ate them! As we stop feeding our family mucus-forming foods, we can eliminate their mucus and allergy diseases for the rest of our lives. "The types of disease which are a result of calcium deposits in the joints, muscles, cells, and glands are readily dissolved and removed from the body. Cholesterol deposits in the arteries and veins also response to the magic cleansing power of the lemonade diet. "All skin disorders also disappear as the rest of the body is cleansed. Boils, abscesses, carbuncles, and pimples come under this category. These conditions are, again, Nature's effort to eliminate poisons quickly from the body. All types of infections are the result of these vast accumulations of poisons being dissolved and burned or oxidized to produce further cleansing of the body. Therefore, rapid elimination of the toxins relieves the need for infectious fevers of all kinds. Infections are not "caught," they are created by Nature to assist in burning our surplus wastes." "Deficiencies do exist, primarily because of improper diet and improper assimilation. These deficiencies also produce toxins because of the deterioration of the cells. So we still have only one disease, and with one simple process, we can eliminate all so-called diseases of whatever name. As we expel the disease-producing toxins from our bodies, we must also restore the deficiencies. Thus, a cleansing diet must also include proper material for building as the waste material is eliminated. 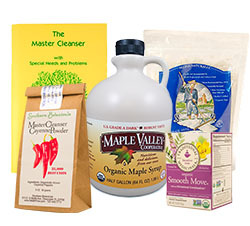 "The Master Cleanser" booklet by Stanley Burroughs is available from Southern Botanicals. Call 727-443-7711.